Affordable housing markets are something of a rarity among big cities these days. This is especially true when you look at the cities with the strongest economies, like New York or San Francisco. Even many once-affordable markets are trending toward scenarios where residents are housing cost-burdened. This is a significant shift that spurs people to take a holistic look at their financial situation and evaluate whether they can remain in a increasingly pricey place. Those who are finding it difficult to afford homeownership amid rising costs may need to be extra creative with their financial advisor. Are you in an area susceptible to this trend? Below, we look at data to find the places where residents are most likely to get priced out of affordable housing markets. To rank the places where residents may be getting priced out of affordable housing markets, we looked at data on household incomes and median home values. We compared these figures over the period from 2016 to 2017. To see where we got our data and how we put it together to create our final rankings, check out our data and methodology below. Dallas is becoming pricier – Dallas is the standout metro area in this study. The city and the area around it have been fairly affordable for a long time, but that may be changing. Three of the top 10 cities that are becoming more expensive are in the Dallas metro area. 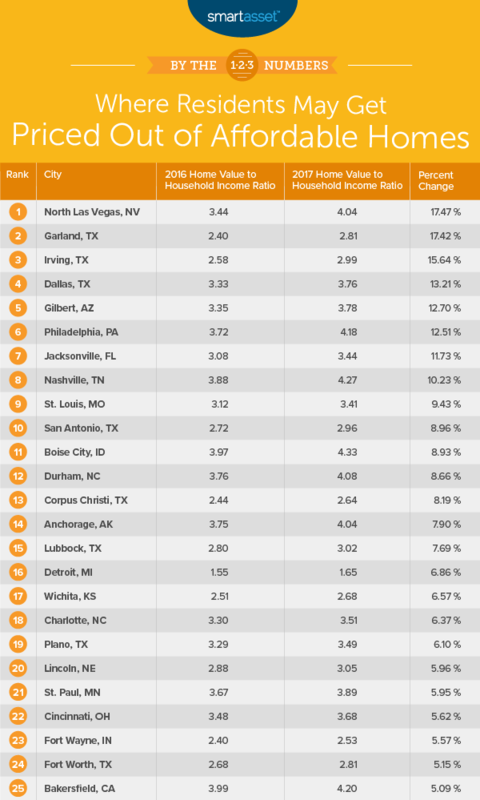 That said, these cities aren’t necessarily pricing residents out quite yet: The average home in Irving and Garland is still worth less than three time the local household’s annual income. More expensive is the norm – Across the 56 affordable housing markets we analyzed, the relative price of the average home is on the rise in 43 of them (more than three-quarters). As the name indicates, North Las Vegas is a city located just north of Sin City. In 2016, this was an affordable place for locals to buy a home. The median household here earned just shy of $56,000 per year, while the median home was worth $192,600. That left a home value to household income ratio of 3.44:1 for the average household. In 2017, though, home values increased while household incomes barely budged. In total, the home value to household income ratio increased by 17.5% from 2016 to 2017. Residents of Garland, Texas will know it’s an affordable place to live. In 2016, the median home was worth $136,700, a bargain for the average household, which earned just shy of $57,100 that year. That meant the average home was worth just 2.4 times the average household’s annual income. In 2017 that figure jumped to 2.8, an increase of 17.4%. While 2.8 is certainly still affordable, a jump of 17.4% in one year is a cause for concern. Just northeast of Garland is Irving, Texas, the third-ranked city. Incomes in Irving are fairly high and growing. From 2016 to 2017, the median household went from earning $61,362 to $62,837 per year. Unfortunately for non-homeowners, home values have appreciated faster than incomes have grown. In 2016, the median home was worth 2.6 times the median household income, while in 2017, the median home was worth three times the median household income. The third Dallas metro area city to claim a spot in this top 10 is the metro area’s principal city: Dallas. Homes here appreciated at a startling rate from 2016 to 2017. In just the 12 month period between 2016 and 2017, the average home in Dallas increased in value by more than 20%. Incomes have not kept up with that growth leaving the average household less able to afford the average home. One of the most livable cities and one of the best places to buy a home big enough for a family is trending in the wrong direction when it comes to home affordability. Residents here are fairly wealthy, and their incomes continue to grow. Despite this growth, homes are becoming less affordable for the average household. In 2016, the average home was worth just under 3.4 times the average household’s income. In 2017, that figure jumped up to just under 3.8. Some cities in this top 10 are going through an economic boom. That pushes up incomes and home prices alike. But for cities in this top 10, the robust economic activity is boosting home values faster than incomes. Philadelphia is an exception, though. The median household income is actually down from 2016 to 2017, while median home values are a bit up. The sum of these two changes means homes are now less affordable for the average household. In fact, the average home is now worth over 4 times the average household’s income. Housing markets in the largest cities in the nation tend to be expensive. Jacksonville bucks this trend. The median home here is worth $177,000, less than the national average. In 2016, the median home in Jacksonville was worth just under 3.1 times the city’s median household income of $51,298. Unfortunately, home values grew from 2016 to 2017 while incomes stagnated. That left a median home to household income ratio of 3.4:1 in 2017. Nashville is one of the priciest cities in our top 10. The median home here is worth just under $247,000, according to 2017 U.S. Census Bureau estimates. That is up more than $36,200, or 17% from 2016. Local household incomes have not kept up. The median home is now worth just under 4.3 times the local household income. That’s an increase of over 10% from 2016. St. Louis is the most affordable city, in absolute terms, in our top 10. In 2016, the median home in St. Louis was worth just $125,800. But in 2017, that figure rose to $141,400. While that is only a modest uptick of 7%, incomes have not kept up. The median home in 2017 is 9.4% more expensive for the average household than it was in 2016. Finally, our list ends in San Antonio, where the relative cost of buying a home has increased by 9% for the average household. This relative rise in the cost of housing came about primarily because of slow income growth. The median household only saw its annual income rise by about $800, whereas the median home increased in value by $14,300 from 2016 to 2017. 2016 Median home value to median household income ratio. This is the 2016 median home value divided by the 2016 median household income. Data comes from the Census Bureau’s 2016 1-year American Community Survey. 2017 Median home value to median household income ratio. This is the 2017 median home value divided by the 2017 median household income. Data comes from the Census Bureau’s 2017 1-year American Community Survey. 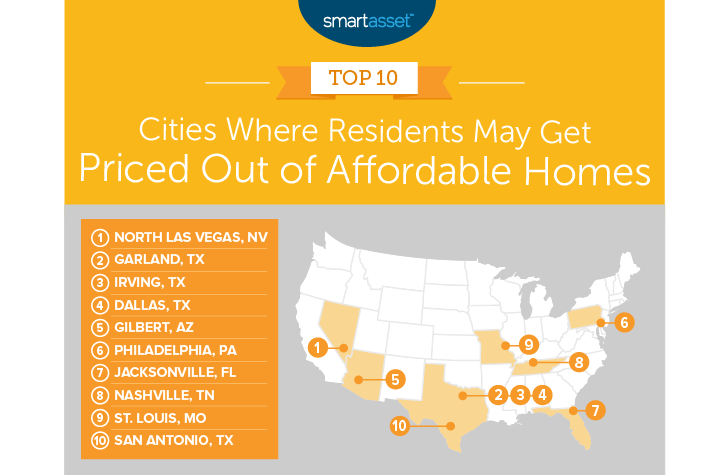 To rank the cities, we first found a list of cities that we considered affordable. To do this, we took the list of the largest 100 cities and filtered out any city that had a 2016 median home value to median household income ratio above 4:1. This left us with 56 cities. We then ranked the cities according to the percent change in home value to household income ratios. The city with the largest percent gain ranked first, while the one with the largest percent drop ranked last. Be aware of the extras – If you are a homeowner, you know the biggest monthly expenditure you face is your mortgage. But homeownership comes with more costs than just the mortgage. For one, repairs to your abode will be made on your dime, which is not usually the case for renters. You will be also on the hook for property taxes, which can be significant, depending on where you live. Hawaii has some of the lowest property taxes while New Jersey has some of the highest. Ask an expert – Which home to buy or whether or not to buy a home at all are important considerations. So why not make sure all the details are taken care of. A financial advisor can advise you on not only how much home you can afford but also how your decision will affect your taxes. If you are not sure of where to find a financial advisor, check out SmartAsset’s financial advisor matching tool. It will pair you with up to three local financial advisors who fit your needs.